The path for risk assets to grind higher has narrowed, in our view. We are moderately risk-on but see opportunity to take profits and rebalance. Economic data painted a mixed picture of global growth trends. The 10-year U.S. government bond yield fell to a 15-month low. Markets expect this week's U.S. jobs report to show nonfarm payrolls growth rebounded in March from a nearly 18-month low in February. Where are risk assets headed after a strong first quarter? We see a repeat as unlikely and a narrower path for a grind higher. The global economy must remain strong enough to quell recession fears but weak enough to keep policymakers on hold, we believe. We are moderately pro-risk, with a penchant to rebalance toward quality. The figures shown relate to past performance and are not a reliable indicator of current or future results. It is not possible to invest directly in an index. Sources: BlackRock Investment Institute, with data from Thomson Reuters, March 2019. Notes: We looked at asset returns in each quarter since 1988 that fell during a late-cycle period. We identify such periods via a "cluster analysis" that groups together time periods where economic series behaved in similar ways. Variables considered include measures of economic slack, wage and price inflation, the monetary policy stance and the growth of private sector leverage. The dots show mean returns over the time period. The bars show the 10th to 90th percentile range. Indexes used are the MSCI World and Emerging Markets indexes, and the Bloomberg Barclays U.S. Government, U.S. Corporate and U.S. High Yield indexes. Index returns do not reflect any management fees, transaction costs or expenses. A key theme from our latest investment outlook: growth slowdown. We see further decelerations in both economic and earnings growth ahead, with pressure on historically high corporate profit margins. Yet we are also increasingly confident that the global economy can remain in late-cycle throughout 2019. How do markets typically fare during late-cycle periods? Global equities produced quarterly returns above the full-cycle historical average, edging out fixed income, according to our analysis. Yet there was wide dispersion and pronounced downside around these averages, particularly in emerging market equities. 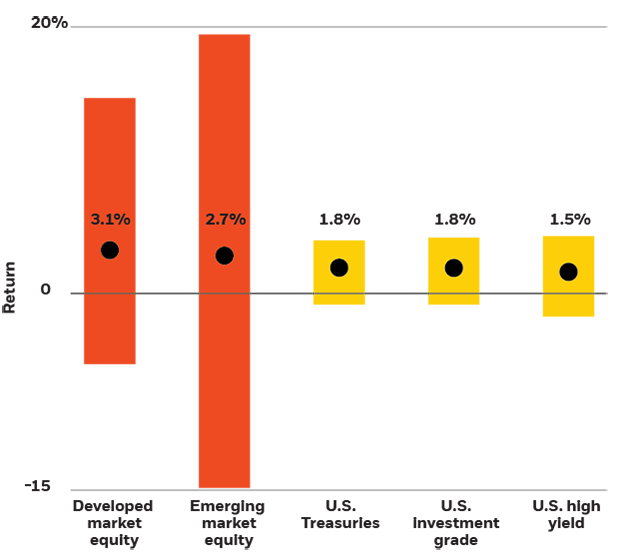 Within fixed income, U.S. Treasuries modestly outperformed riskier credit sectors. See the chart above. We introduce a new investment theme this quarter: patient policymakers. It reflects the Federal Reserve's dovish pivot - and a similar emphasis on patience among other developed market central banks. China has moved to easier credit and fiscal policies, but with greater caution than in the 2015-2016 downturn. The supportive stance of global policymakers should underpin both equities and bonds. Yet the strength of the year-to-date rally across markets looks fragile and hard to replicate, and we believe market expectations of U.S. monetary policy are now overly dovish. This is where our third theme, balancing risk and reward, takes on new importance. Signs of a more pronounced growth slowdown or new trade disputes have the potential to stoke uncertainty. A rapid rise in asset valuations and plunge in volatility point to creeping market complacency, but fund flows and market positioning are far from euphoric. These crosscurrents lead us to favor a selective approach to risk-taking in the second quarter. We see quality assets, including U.S. Treasuries, as an important source of portfolio resilience. Bottom line: We remain modestly overweight stocks versus bonds, but favor trimming exposures that have notched particularly strong returns so far this year. Our preferred regions remain the U.S. and emerging markets. We favor quality equities in sectors that can sustain earnings growth even in a slowing economic environment, such as selected health care and tech firms. In bonds, we focus on income, including emerging market debt, but also see an important role for U.S. Treasuries as portfolio shock absorbers. Global economic data painted a mixed picture. Consumer confidence in both the U.S. and Germany fell, but Germany's Ifo business climate index exceeded expectations. U.S. consumer spending in January was softer than expected while core inflation eased. The 10-year U.S. government bond yield fell to a 15-month low. Some emerging market currencies experienced turbulence. The Turkish lira's wild swings extended into a second week ahead of local elections. The Brazilian real dropped to a five-month low against the U.S. dollar on concerns that President Jair Bolsonaro's signature pension reform might be stalling. The Argentine peso hit a record low against the dollar on growth worries. The UK Parliament rejected Prime Minister Theresa May's Brexit deal for a third time. We see growing likelihood of further delays to the Brexit process. The U.S. and China resumed trade talks, though few details emerged. Source: Thomson Reuters DataStream. As of March 29, 2019. Notes: Weekly data through Friday. Equity and bond performance are measured in total index returns in U.S. dollars. U.S. large caps are represented by the S&P 500 Index; U.S. small caps are represented by the Russell 2000 Index; Non-U.S. world equity by the MSCI ACWI ex U.S.; non-U.S. developed equity by the MSCI EAFE Index; Japan, Emerging and Asia ex-Japan by their respective MSCI Indexes; U.S. Treasuries by the Bloomberg Barclays U.S. Treasury Index; U.S. TIPS by the U.S. Treasury Inflation Notes Total Return Index; U.S. investment grade by the Bloomberg Barclays U.S. Corporate Index; U.S. high yield by the Bloomberg Barclays U.S. Corporate High Yield 2% Issuer Capped Index; U.S. municipals by the Bloomberg Barclays Municipal Bond Index; non-U.S. developed bonds by the Bloomberg Barclays Global Aggregate ex USD; and emerging market $ bonds by the JPMorgan EMBI Global Diversified Index. Brent crude oil prices are in U.S. dollars per barrel, gold prices are in U.S. dollar per troy ounce and copper prices are in U.S. dollar per metric ton. The Euro/USD level is represented by U.S. dollar per euro, USD/JPY by yen per U.S. dollar and Pound/USD by U.S. dollar per pound. This week's U.S. employment data will offer clues about the health of the labor market - and the overall economy. Markets are keen to learn if February's weak nonfarm payrolls growth - the slowest since September 2017 - was a one-off or the start of a downtrend. Consensus estimates point to a rebound in the March data. This would confirm ongoing strength in the labor market and potentially ease growth worries caused by a recent raft of mixed global economic data. Asia ex-Japan The economic backdrop is encouraging, with near-term resilience in China and solid corporate earnings. We like selected Southeast Asian markets but recognize a worse-than-expected Chinese slowdown or disruptions in global trade would pose risks to the entire region. Fixed Income U.S. government bonds We are cautious on U.S. Treasury valuations after the recent rally, but still see them as portfolio diversifiers given their negative correlation with equities. We expect a gradual steepening of the yield curve, driven by still-solid U.S. growth, a Fed willing to tolerate inflation overshoots - and a potential shift in the Fed's balance sheet toward shorter-term maturities. This supports two- to five-year maturities and inflation-protected securities. U.S. municipals We see coupon-like returns amid a benign interest rate backdrop and favorable supply-demand dynamics. New issuance is lagging the total amount of debt that is called, refunded or matures. The tax overhaul has made munis' tax-exempt status more attractive in many U.S. states, driving inflows. U.S. credit A still-growing economy, reduced macro volatility and a decline in issuance support credit markets. Conservative corporate behavior - including lower mergers and acquisitions volume and a focus on balance sheet strength - also help. We favor BBBs and prefer bonds over loans in high yield. European credit "Low for longer" ECB policy should reduce market volatility and support credit as a source of income. European bank balance sheets have improved after years of repair, underpinning fundamentals. Yet valuations are rich after a dramatic rally. We prefer high yield credits, supported by muted issuance and strong inflows. Asia fixed income A focus on quality is prudent in credit. We favor investment grade in India, China, and parts of the Middle East, and high yield in Indonesia. We are cautious on Chinese government debt despite its inclusion in global indexes from April. We see rising funding needs outstripping foreign inflows. Other Commodities and currencies * A reversal of recent oversupply is likely to underpin oil prices. Any relaxation in trade tensions could boost industrial metal prices. We are neutral on the U.S. dollar. It has perceived "safe-haven" appeal but gains could be limited by a high valuation and a narrowing growth gap with the rest of the world.